By Harlan West, Design and Marketing Professional with 25 years of experience designing materials for major healthcare organizations, municipalities and large corporations. Have you ever gone into a doctor’s office for a scheduled appointment only to be forced to wait an hour or more? Yes, we all have had this unfortunate experience. Doctors seem to think that their time is more valuable than the average person’s. True, emergencies do come up and some patients take much longer to examine and diagnose than others. Now, we all know how doctors tend to fill their waiting rooms with stacks of dated magazines that often contain technical content or boring articles about such unexciting topics as a golf stroke. C’mon, let’s get with the times! In this world of constantly evolving healthcare procedures, policies and regulations, doctors, more than ever, need to better communicate with their patients. 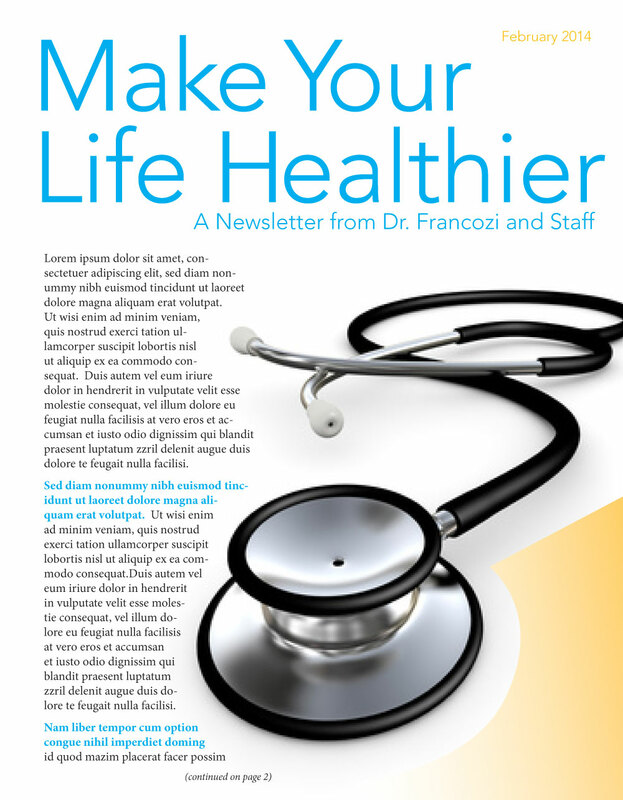 Below is a sample newsletter design we created to be used in a doctor’s office waiting room. 1) As mentioned above, it’s a great way to connect with patients and staff. These new letters are a great way to introduce new associate doctors, office staff or clinicians to the patient. 2) Newsletters placed in the waiting room will most likely have a very high readership rate. Similar to onboard rail newsletters that I discuss in previous posts, physician newsletters can be strategically placed in the waiting room to take advantage of a captive audience. Indeed, patients are sitting waiting and watching the clock with nothing to do. They are just trying to l time until they are called to come back into the examination room. They are very likely to pick up any attractive and interesting reading material in front of them. Try a more “home-baked” yet at the same time professional approach to the newsletter. With such an approach, patients may feel more relaxed. 3) Newsletters can help take away some of the depersonalization of today’s healthcare. Too often we feel like just a number in a heard of cattle. This is especially true where doctors groups, medical groups or HMOs are involved. Stories about doctors, their staff, new services, billing policies, new procedures or medical innovations can help put patient’s fears at ease. Articles about patient success stories can also increase the comfort level. But, be careful not to divulge patient information without their prior consent. Due to privacy concerns, it is essential to leave out names and actual photos. 4) Newsletters can also be a great medium for building awareness on the importance of fitness, exercise and healthy eating. Try including stretching exercises that can be done at home or in the office. Generic photos of active “boomers” living a healthy lifestyle are great additions to help perk up the newsletter. With a regular newsletter, healthcare practitioners can more easily “preach” to their patients about such hard-to-discuss topics as weight loss, proper hygiene, cancers and sexually transmitted diseases. 5) A regular monthly newsletter can allow a doctor to show a more compassionate side even if he or she does not have a great “bedside manner.” Articles about the physician and how he or she is helping patients receive the best care can go along way to bridging this gap. In other words, a physician newsletter can show a new side of the doctor, even, if in person, he is not a very compassionate individual. A physician newsletter can make for a healthy patient doctor care experience! Harlan West is the author of successfulcorporatecommunications.com and has been working as a creative director and design professional for more than 25 years and has designed and art directed hundred of publications for both print and online purposes. I am proud to commemorate the publication of 50 blog posts! Celebrate with us by continuing to read our blog and encouraging your friends and colleagues to subscribe as well. Take advantage of valuable design tips for your newsletter. Use color to make a more effective publication. Learn how to create effective mastheads. Escape the pitfalls of staff meetings. Learn ways to deal more effectively with your clients. Discover how to create more effective bilingual publications. Find valuable tips on advertising. Gain valuable information about e-publications. Increase your knowledge of printing techniques. Increase your appreciation of elegant paper stocks. Learn how to create effective event promotions. Discover ways to include effective infographics, charts and diagrams in your publications. Learn about ways to find employment as a skilled graphic designer. 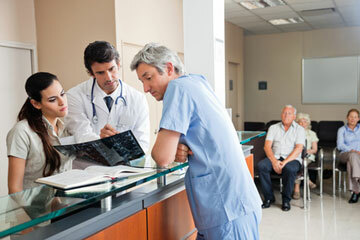 Unearth new ways to promote healthcare events. Invent new ways to illustrate your newsletter with the use of graphical icons. Find ways to develop an effective logo for your company. Learn about ways to add a mascot or cartoon character to your newsletter or publication. Differentiate your company’s product and service from the competition. Produce beautiful maps that provide more than just directions. Explore new ways to be more responsive to your clients. Recognize how to find a quality print vendor. Realize the beauty that nature can add to a publication. Originate the use of iMags for your company’s publications. Learn how to save $1,000’s on publication costs. Conceive of new ways to use patterns in your publications. Innovate the use of online publications in your company’s publication requirements. Discover ways to add navigational elements to a newsletter. Lean how to use photos for maximum impact. Make the best use of typestyles to increase the legibility of a publication. Find new ways to maintain quality control. Learn how outsourcing the design of your publications can save the company money and can increase the return on investment (ROI). Find out why it is important to use a marketing firm that specializes in your industry sector. Discover the importance of having a corporate newsletter. Explore new reasons why corporations should outsource their marketing efforts. Unearth the ultimate checklist for developing successful marketing materials. Invent new ways to harness the power of the word of mouth. Explore how color defines your brand and shapes your newsletter. Find out how silhouetted graphics can shape your newsletter. Invent beautiful patterns and graphics through the use of shadows. Learn how metallic pins can make great promotional items or giveaways to honor anniversaries, celebrations, or facility openings. Discover how to use fruits and vegetable shapes to craft an unusual masthead or headline. 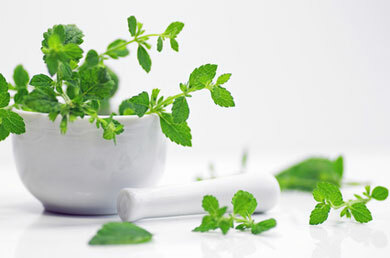 Learn how to create healthy designs for healthcare marketing. Pioneer new ways to include graphical portraiture in your publication. Discover how to make your newsletter soar to new heights by adding architectural elements. Find out how to add edgy border treatments that will make your articles jump off the page. Recognize the importance of type and how it impacts the look, feel and legibility of the publication. Discover ways to “tune-up” your marketing without ever getting your hands dirty. These topics and more can be found on our blog. If your company needs an innovative newsletter, e-publication, meeting presentation or advice on communicating, please contact HWDS at hwdesign@west.net. We make beautiful things happen. To find out more please visit westdesign.com. Harlan West is the author of successfulcorporatecommunications.com and has been working as a creative director and design professional for more than 25 years and has designed and art directed hundreds of publications for both print and online purposes. By Harlan West, Design and Marketing Professional with 25 years of experience designing materials for major healthcare organizations, hospitals, medical centers and outpatient facilities. Caring for patients also includes caring for the type and quality of the communications they receive. The healthcare industry uses lots of collaterals and informational pieces to communicate with patients, members, physicians, staff, agencies and suppliers. Marketing firms that specialize in healthcare publications are often called in to create external and internal communications for larger organizations. As one of these marketing firms, HWDS Creative has developed hundreds of effective print and online e-publications for the healthcare industry.